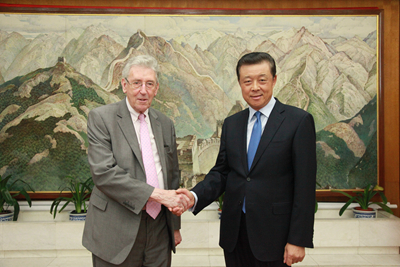 On 5 August, Ambassador Liu Xiaoming met with Lord Howell of Guildford,Chairman of International Relations Committee of House of Lords, at the Embassy and exchanged views with Lord Howell on China-UK relations. Ambassador Liu said that China-UK relations were at an important historical juncture. The two countries should bear in mind the fundamental interests of people in the two countries and make joint efforts to sustain the hard-won momentum of China-UK relations. Ambassador Liu appreciated Lord Howell for his continuous support for the development of China-UK relations, and hoped that Lord Howell, as Chairman of International Relations Committee of House of Lords and a veteran of the Conservative Party, would continue to support parliamentary and party-to-party exchanges between China and the UK, making greater contributions to mutual understanding and development of China-UK relations. Lord Howell regarded China as the hope of the world and an opportunity for the UK. Developing relations with China is an inevitable choice of the UK based on its national interest, said Lord Howell, who reaffirmed that the International Relations Committee of House of Lords and he personally would stay committed to advancing exchanges and cooperation with China and would play an active role in promoting the bilateral relations.